So you want more power out of your Mazdaspeed 3 but you still want it to look and sound like stock. Maybe you don?? ?t want your wife to know you modified your car. Maybe you don?? ?t want your buddy with the WRX or EVO to know you are coming after him. How does an additional 40 whp and 50 ft-lbs of torque sound? Sounds good? 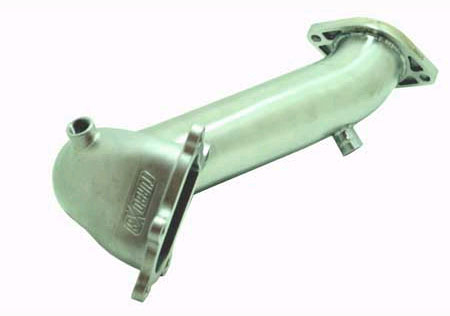 Then you want the TurboXS Mazdaspeed 3 Stealthback Exhaust (MS3-SBE). The TurboXS Stealthback Exhaust (MS3-SBE-RP) consists of our Mazdaspeed 3 Downpipe (MS3-DP) and our Mazdaspeed 3 Racepipe (MS3-RP) mated to your factory catback exhaust. It looks like it?? ?s stock. It sounds like it?? ?s stock. It definitely does not drive like it?? ?s stock. The Mazdaspeed 3 Downpipe starts with a precision die cast stainless steel bellmouth, engineered for maximum flow to speed up turbocharger spool up on the low end and avoid a boost creep on the top end. We even designed in clearance notches to make installation easier. The die cast bellmouth is TIG welded to 3 inch diameter mandrel bent stainless steel tubing. The last piece of the puzzle is our die cast ?? ?No Warp??? stainless steel flange. We also ?? ?double bung??? the rear O2 sensor bung to reduce the chance of throwing a Check Engine Light. The Mazdaspeed 3 Racepipe is made from full 3 inch diameter mandrel bent stainless steel tubing bookended by our ?? ?No Warp??? die cast stainless steel flanges. It includes a flex joint to take the stress of the massive amount of engine movement that the stock engine mounts allow. All nuts, bolts, washers and gasket for our pipes included. You will need a new Mazda turbocharger to Downpipe gasket if you want to replace it when installing the MS3-SBE. The TurboXS Mazdaspeed 3 Stealthback Exhaust: Looks Stock. Sounds Stock. Insanely Faster than Stock.